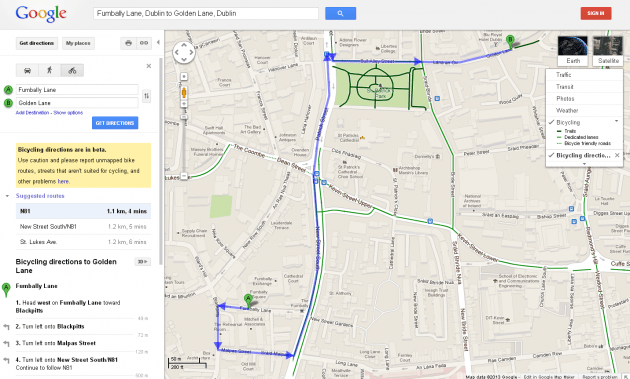 HERE’S SOME NEWS to put Ireland’s cyclists in a good mood for the weekend: Google Maps now allows users to find cycling directions between any two points in Ireland. The feature has been added to Google Maps as of this evening, and aims to find the optimal cycling path between any two locations in the country. The service has broken down Ireland’s roads and pathways into four categories – trails, roads with dedicated bicycle lanes, bicycle-friendly roads, and total no-go areas. The data has been partially contributed by Google Maps users through the Mapmaker tool, and also incorporates details to help cyclists avoid the busiest roads. Updates to the Google Maps app for smartphones will allow cyclists to plug in their earphones and listen to directions as they cycle. Users have been encouraged to help Google refine the service by clicking the ‘Report a problem’ link on the Google Maps website if a road has been inappropriately marked as being friendly to cyclists, or if a route is missing. As well as Ireland, cycling directions are now available for locations in France, Luxembourg, Germany, Poland and Liechtenstein.